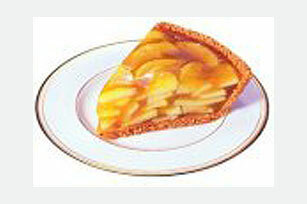 English majors will appreciate the word play in this recipe—where a fragrant and lemony apple tart is made with tart Granny Smith apples. Bring first 4 ingredients to boil in medium saucepan on medium heat; cook 5 min. or until apples are tender, stirring occasionally. Mix cornstarch and water; stir into apple mixture. Return to boil; cook 1 min., stirring constantly. Remove from heat. Add dry gelatin mix; stir until completely dissolved. Pour into crust. Refrigerate several hours or until firm. Garnish with thawed COOL WHIP Whipped Topping just before serving. Substitute water for the apple juice.